"Department of Health and Human Services" redirects here. For government departments by that name in other jurisdictions, see Department of Health and Human Services (disambiguation). The Federal Security Agency (FSA) was established on July 1, 1939, under the Reorganization Act of 1939, P.L. 76-19. The objective was to bring together in one agency all federal programs in the fields of health, education, and social security. The first Federal Security Administrator was Paul V. McNutt. The new agency originally consisted of the following major components: (1) Office of the Administrator, (2) Public Health Service (PHS), (3) Office of Education, (4) Civilian Conservation Corps, and (5) Social Security Board. By 1953, the Federal Security Agency's programs in health, education, and social security had grown to such importance that its annual budget exceeded the combined budgets of the Departments of Commerce, Justice, Labor and Interior and affected the lives of millions of people. Consequently, in accordance with the Reorganization Act of 1949, President Eisenhower submitted to the Congress on March 12, 1953, Reorganization Plan No. 1 of 1953, which called for the dissolution of the Federal Security Agency and elevation of the agency to Cabinet status as the Department of Health, Education, and Welfare. The plan was approved April 1, 1953, and became effective on April 11, 1953. The six major program-operating components of the new Department were the Public Health Service, the Office of Education, the Food and Drug Administration, the Social Security Administration, the Office of Vocational Rehabilitation, and St. Elizabeth's Hospital. The Department was also responsible for three federally aided corporations: Howard University, the American Printing House for the Blind, and the Columbia Institution for the Deaf (Gallaudet College since 1954). 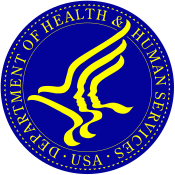 The Department of Health, Education, and Welfare was renamed the Department of Health & Human Services (HHS) in 1979, when its education functions were transferred to the newly created United States Department of Education under the Department of Education Organization Act. HHS was left in charge of the Social Security Administration, agencies constituting the Public Health Service, and Family Support Administration. In 1995, the Social Security Administration was removed from the Department of Health & Human Services, and established as an independent agency of the executive branch of the United States Government. The Department of Health & Human Services is led by the United States Secretary of Health and Human Services, a member of the United States Cabinet appointed by the President of the United States with the consent of the United States Senate. The Secretary is assisted in managing the Department by the Deputy Secretary of Health and Human Services, who is also appointed by the President. The Secretary and Deputy Secretary are further assisted by seven Assistant Secretaries, who serve as top Departmental administrators. As of Jan. 20, 2018, this is the top level of the organizational chart. HHS provides further organizational detail on its website. Several agencies within HHS are components of the USPHS or Public Health Service (PHS), as noted below. With the passage of the Fraud Enforcement and Recovery Act of 2009, and the Affordable Care Act of 2010, the Office of the Inspector General has taken an emboldened stance against healthcare related non-compliance, most notably for violations of Stark Law and the Anti-Kickback Statute. There are three tiers of health departments, the federal health department, state health department and local health department. In relation with state and local government, the federal government provides states with funding to ensure that states are able to retain current programs and are able to implement new programs. The coordination between all three health departments is critical to ensure the programs being implemented are well structured and suited to the corresponding level of health department. The health department at state level needs to safeguard good relations with legislators as well as governors in order to acquire legal and financial aid to guarantee the development and enhancements of the programs. Assemblies are set up to guide the relationships between state and local health departments. The state sets up the regulations and health policies whereas the local health departments are the ones implementing the health policies and services. The Department of Health & Human Services' administers 115 programs across its 11 operating divisions. The United States Department of Health & Human Services (HHS) aims to "protect the health of all Americans and provide essential human services, especially for those who are least able to help themselves." These federal programs consist of social service programs, civil rights and healthcare privacy programs, disaster preparedness programs, and health related research. HHS offers a variety of social service programs geared toward persons with low income, disabilities, military families, and senior citizens. Healthcare rights are defined under HHS in the Health Insurance Portability and Accountability Act (HIPAA) which protect patient's privacy in regards to medical information, protects workers health insurance when unemployed, and sets guidelines surrounding some health insurance. HHS collaborates with the Office of the Assistant Secretary for Preparedness and Response and Office of Emergency Management to prepare and respond to health emergencies. A broad array of health related research is supported or completed under the HHS; secondarily under HHS, the Health Resources & Service Administration houses data warehouses and makes health data available surrounding a multitude of topics. HHS also has vast offering of health related resources and tools to help educate the public on health policies and pertinent population health information. Some examples of available resources include disease prevention, wellness, health insurance information, as well as links to healthcare providers and facilities, meaningful health related materials, public health and safety information. This program is to ensure the act and accountability of medical professionals to respect and carry-out basic human health rights. In the United States, the government feels that it is essential for the American people to understand their civil duty and rights to all of their medical information. That includes: health insurance policies or medical records from every doctor or emergency visit in one's life. Through Health & Human services one is able to file a complaint that their HIPAA rights have been violated or a consultant that will be able to decide if their rights were violated. This branch has everything to do with the social justice, wellness, and care of all people throughout the United States. This includes but is not limited to people who need government assistance, foster care, unaccompanied alien children, daycares (headstart included), adoption, senior citizens, and disability programs. Social services is one of it not the largest branch of programs underneath it that has a wide variety throughout the United States at a state and local level. The prevention and wellness program's main idea is to give the American people the ability to live the healthiest and best lifestyle physically that they can. They are the ones who deal with vaccines and immunizations, which fight from common diseases to deadly ones. The nutrition & fitness program that are the basics of healthy eating and regular exercise. Health screenings & family health history which are crucial in the knowledge of each individual's health and body. A severely important one especially in today's society is mental health & substance abuse in where they help people with mental illness and drug abuse. Lastly, they help with environmental health where people are researching and studying how our environments both physical and metaphorically have a short and long term effect on our health and wellness. HHS plays a role in protecting the United States against bioterrorism events. In 2018, HHS released a new National Biodefense Strategy required by passage of the 2016 Biodefense Strategy Act. The Biodefense Strategy required implementation of a biodefense strategy after a 2015 Blue Ribbon Study Panel on Biodefense report found that the 2009 National Strategy for Countering Biological Threats was inadequate in protecting the U.S. The strategy adopted these five central recommendations: creating a single centralized approach to biodefense; implementing an interdisciplinary approach to biodefense that brings together policy makers, scientists, health experts, and academics; drawing up a comprehensive strategy to address human, plant, and animal health; creating a defense against global and domestic biological threats; and creating a proactive policy to combat the misuse and abuse of advanced biotechnology. HHS also runs the Biodefense Steering Committee, which works with other federal agencies including the Department of State, Department of Defense (DOD), U.S. Food and Drug Administration, Department of Homeland Security (DHS), and the Environmental Protection Agency. HHS specifically oversees Project BioShield, established in 2003 and operating since 2004, and its development and production of genetically based bio-weapons and vaccines. HHS together with DHS are authorized under the Homeland Security Act of 2002 to deploy the weapons and vaccines produced by Project BioShield on the US general public under martial law during "emerging terrorist threats" or public health emergencies. Both HHS and DHS have similar authorities through state-based legislation adopted from Model State Emergency Health Powers Act provisions. In 2016, a published US Senate report revealed that several dozen unaccompanied children from Central America, some as young as fourteen years old, were released from custody to traffickers where they were sexually assaulted, starved or forced to work for little or no pay. The HHS sub agency Office of Refugee Resettlement (ORR) released approximately 90,000 unaccompanied children during 2013-2015 but did not track their whereabouts or properly screen families accepting these children. To prevent similar episodes, the Homeland Security and Health & Human Services Departments signed a memorandum of understanding in 2016, and agreed to establish joint procedures within one year for dealing with unaccompanied migrant children. As of 2018 they have failed to do so. Between October and December 2017, officials from ORR tried to contact 7,635 children and their sponsors. From these calls, officials learned that 6,075 children remained with their sponsors. Twenty-eight had run away, five had been removed from the United States and fifty-two had relocated to live with a non sponsor. However, officials have lost track of 1,475 children. ORR claims it is not legally liable for the safety and status of the children once released from custody. DHS claims the migrating children are "terror threats", despite all evidence to the contrary. After falsely categorizing people as terror threats, a range of unconstitutional activities can be undertaken by HHS and DHS. Beyond trafficking and disappearing migrating children, HHS is evidenced to be actively coercing and forcing bio-substances such as antipsychotics on migrating children without consent, and under questionable medical supervision. Medical professionals state that wrongly prescribed antipsychotics are especially dangerous for children, and can cause permanent psychological damage. Medical professionals also state DHS and HHS incarceration and separation policies are likewise causing irreparable mental harm to the children. Children are also dying in HHS custody. The forced drugging, deaths, and disappearances of migrating Mexican and Central American children might be related to DHS falsely labeling them and their families as 'terror threats' before HHS manages their incarcerations. Despite a federal court order, the DHS separation practices mandated by the Trump administration's "zero-tolerance" policy have not been halted, and HHS has not stopped forcing drugs on the children it incarcerates. ^ (ASFR), Office of Budget (OB), Assistant Secretary for Financial Resources (March 27, 2014). "2015 Budget in Brief". Archived from the original on May 2, 2015. ^ "About HHS". U.S. Department of Health & Human Services. Archived from the original on November 13, 2013. Retrieved November 13, 2013. ^ "Department of Health, Education, and Welfare. A Common Thread of Service: An Historical Guide to HEW. DHEW Publication No. (OS) 73-45". July 1, 1972. Archived from the original on February 14, 2014. Retrieved January 9, 2014. ^ Preliminary inventory of the records of the Department of Health, Education, and Welfare (PI 181, Record Group 235), National Archives and Records Service, 1975. ^ "Office of the Law Revision Counsel, U.S. House of Representatives, Title 20, Section 3508". house.gov. Archived from the original on June 19, 2012. Retrieved January 7, 2012. ^ Full text of the Department of Education Organization Act Archived May 7, 2018, at the Wayback Machine, P.L. 96-88. ^ "Becker's Hospital Review". Archived from the original on August 29, 2015. ^ "Becker's Hospital Review" (PDF). Archived (PDF) from the original on July 1, 2015. ^ "Becker's Hospital Review". Archived from the original on July 14, 2015. ^ "Ludi, Inc. Closes $1M in Series A Financing". Business Wire. Archived from the original on September 10, 2015. ^ "Policy Statement Development Process". American Public Health Association. Archived from the original on October 1, 2017. Retrieved September 30, 2017. ^ "The State Health Department". American public health department. Archived from the original on September 17, 2017. Retrieved September 30, 2017. ^ 2015 Department of Health & Human Services Budget-in-Brief Archived March 26, 2015, at the Wayback Machine, pg 10, United States Department of Health & Human Services, Accessed July 14, 2015. ^ Budget and Performance Archived April 28, 2015, at the Wayback Machine. HHS.gov. Retrieved on April 15, 2014. ^ (ASPA), Assistant Secretary for Public Affairs (January 29, 2015). "Programs & Services". HHS.gov. Archived from the original on September 17, 2017. ^ (ASPA), Digital Communications Division (DCD), Assistant Secretary for Public Affairs (February 26, 2015). "Social Services". hhs.gov. Archived from the original on September 17, 2017. ^ "Preparedness Home - PHE". www.phe.gov. Archived from the original on September 19, 2017. ^ "Office of Emergency Management - PHE". www.phe.gov. Archived from the original on September 7, 2017. ^ (ASPA), Digital Communications Division (DCD), Assistant Secretary for Public Affairs (February 26, 2015). "Research". hhs.gov. Archived from the original on September 17, 2017. ^ "HealthData.gov". www.healthdata.gov. Archived from the original on September 17, 2017. ^ (ASPA), Digital Communications Division (DCD), Assistant Secretary for Public Affairs (February 26, 2015). "Prevention & Wellness". hhs.gov. Archived from the original on September 17, 2017. ^ (ASPA), Digital Communications Division (DCD), Assistant Secretary for Public Affairs (February 26, 2015). "Health Insurance". hhs.gov. Archived from the original on September 17, 2017. ^ (ASPA), Digital Communications Division (DCD), Assistant Secretary for Public Affairs (April 9, 2015). "Providers & Facilities". hhs.gov. Archived from the original on September 17, 2017. ^ (ASPA), Digital Communications Division (DCD), Assistant Secretary for Public Affairs (March 3, 2015). "Featured Topic Sites". hhs.gov. Archived from the original on September 17, 2017. ^ (ASPA), Digital Communications Division (DCD), Assistant Secretary for Public Affairs (February 26, 2015). "Public Health & Safety". hhs.gov. Archived from the original on September 17, 2017. ^ "Home - Office of Child Support Enforcement - Administration for Children and Families". Archived from the original on August 18, 2015. ^ "Strengthening Communities Fund". U.S. Department of Health & Human Services. Archived from the original on February 1, 2013. ^ "Strengthening Communities Fund: American Recovery and Reinvestment Act Implementation Plan" (PDF). U.S. Department of Health & Human Services. May 24, 2010. Archived from the original (PDF) on January 16, 2013. ^ a b "A Multi-Disciplinary Approach to Multi-Disciplinary Threats". The Pandora Report. 2018-10-04. Retrieved 2018-12-31. ^ "Almost 1,500 Migrant Children Placed in Homes by the U.S. Government Went Missing Last Year". Time. Retrieved 2018-05-26. ^ "U.S. Placed Immigrant Children With Traffickers, Report Says". The New York Times. 2016-01-28. ISSN 0362-4331. Retrieved 2018-05-26. ^ "Federal Agencies Lost Track of Nearly 1,500 Migrant Children Placed With Sponsors". The New York Times. 2018-04-26. ISSN 0362-4331. Retrieved 2018-05-26. ^ CNN, Dakin Andone,. "US lost track of 1,500 immigrant children, but says it's not 'legally responsible'". CNN. Retrieved 2018-05-26. ^ Ackerman, Spencer (January 10, 2019). "DHS Accused of Lying, Again, About a Terrorism-Immigration Link". Retrieved March 7, 2019 – via www.thedailybeast.com. ^ Caroline Chen, Jess Ramirez (July 20, 2018). "Immigrant Shelters Drug Traumatized Teenagers Without…". ProPublica. Retrieved March 7, 2019. ^ Chan, Tara Francis. "Migrant children say they've been forcibly drugged, handcuffed, and abused in US government detention". Business Insider. Retrieved March 7, 2019. ^ "Children Separated From Parents". Psychology Today. Retrieved March 7, 2019. ^ "Doctors Concerned About 'Irreparable Harm' To Separated Migrant Children". NPR.org. Retrieved March 7, 2019. ^ Merchant, Nomaan (December 27, 2018). "Deaths of 2 children raise doubts about US border agency". AP NEWS. Retrieved March 7, 2019. ^ "Attorney General Announces Zero-Tolerance Policy for Criminal Illegal Entry". www.justice.gov. April 6, 2018. Retrieved March 7, 2019. ^ Making the Grade: Access to Information Scorecard 2015 Archived March 13, 2016, at the Wayback Machine March 2015, 80 pages, Center for Effective Government, retrieved March 21, 2016. Wikimedia Commons has media related to United States Department of Health & Human Services.